"A SPORT FOR NEXT SEASON, IN THE NORTHERN FOREST!" 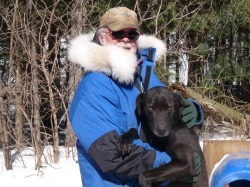 It is a joke in the Mushing World:" Wait until next season!" Every musher has program in effect to improve his/her team for the next year. After a season of running/racing, we see areas were we have short falls and areas were we can improve. It can be in training, nutrition, equipment, breeding and acquiring position dogs. This season, I recognized needs for improvement on nutrition, race preparation, breeding and the need for more leaders. I am happy to say that all the needs were met with the exception of leaders. I am now happy to say that this week the leader requirement was fulfilled! It is my pleasure to announce the addition of Bergen & Perle to the Miortuk Kennel. Bergen is a 2 1/2 year old experienced race leader with impeccable lineage. Perle is 18 months old potential leader out of Ellis/T. Streeper breeding. Both of these dogs love to run & fit very well into my team ( they were on loan here for three weeks from Valerie & Laurent Gonsolin). More information on these two dogs can be found on the Profile & Pedigree pages of this website. I am deeply appreciative of the generosity, friendship & working relationship I have with Valerie & Laurent Gonsolin who made all this possible. All the puppies here are growing & developing nicely. They show a lot of potential for next season & many seasons to follow. There are a few updated photos of them on the Puppy Page. This past week, I took Michele & Ben to a Cabane à Sucre as a reward for a great season here & to show appreciation for their assistance. A Cabane à Sucre is a Spring tradition here in Quebec were we gather the sap from the Maple Trees & make Maple Syrup. The meal is a annual feast served at a small family run sugar farm were they still gather the sap & process it in an old traditional way. It usually consists of Pea Soup, Fried Pork Rinds, Home made Tomato Relish, Pickled Beets, Pickles, Eggs, Bacon, Sausage, Ham, warm Home Made bread, Creton, Boiled Potatoes, Baked Beans & finally Fritters served with Maple Syrup. Of coarse there is a pitcher of Maple Syrup on the table to dress all of the above as you see fit. After the meal, you go to another room where they are boiling the syrup & have a Maple Syrup Taffy served on a stick. The warm syrup is pored on some snow & you roll it up on the stick to eat. Needless to say after all this you are very full & on a Sugar High!